Welcome to Parade Pins Ltd, formerly Poppy Pins Ltd.
Due to recent changes enforced upon us by the Royal British Legion we are now unable to supply you with the trademarked 2 petal poppy, or call ourselves Poppy Pins Ltd.
We have designed and copyrighted our own unique 3 petal poppy and, sadly, had to change our eye catching name. That aside we are still producing to the same high standard of quality in our new range of badges. 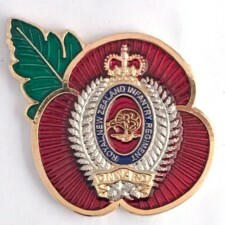 May I take the time to introduce myself, my company Parade Pins Ltd and our range of Regimental Poppy Badges. My name is Simon Tattersall. I served for 14 years with The Royal Artillery, serving in Germany Northern Ireland, & at the ACIO in Bristol. Parade Pins Ltd is a UK (Bristol) based Company. All of our poppy badges are manufactured In The UK, unlike some competitors which are Made In China. We all know “Lest We Forget” and “We Will Remember Them”. We all stand at Cenotaphs and Memorials around the country on 11th November. I wanted a way to remember and celebrate Regimental comrades, and that was my reasoning behind setting up Poppy Pins Ltd, now Parade Pins Ltd, and it’s range of Regimental badges. This has since blossomed to encompass Civil & Reserve Forces, together with Uniformed Youth Organisations. We have found our Badges were worn, not only by Serving Members, but also by family, friends and widows/widowers of fallen comrades. SSAFA, BLESMA, BLIND VETERANS UK and The RBL, despite the actions they have taken towards us. The cost per Poppy Badge is £10.00. This includes UK and BFPO postage, VAT where applicable, and our donation to the charities. We are more than happy to post World Wide; there are International postage rates at check out. Our Poppy Badges are 33mm tall by 35mm wide, about the same size as a paper poppy, with a brooch safety clasp fastener, but much more durable and can be worn everyday. Parade Pins Ltd hold a full MOD Merchandising Licence and as such where applicable to MOD crests used all our badges are Officially Licensed Products. We dispatch ALL of our orders by Royal Mail 1st Class large letter. If your order is received before midday on a working day it will be posted that day, if not, the next working day. We hold Stocks of Regimental Poppy Badges, but you will appreciate that as we are purely driven by day-by-day Customer Orders, there is no way to accurately forecast demand and, inevitably, at times of high demand items will go Out of Stock. Please see our F A Q’s Page on how to join the waiting list for a badge. We trust these points are informative and that you have a pleasant shopping experience on our web page. If you like what we do please tell others, if not, please tell us! BADGES MADE WITH PASSION, TO BE WORN WITH PRIDE.